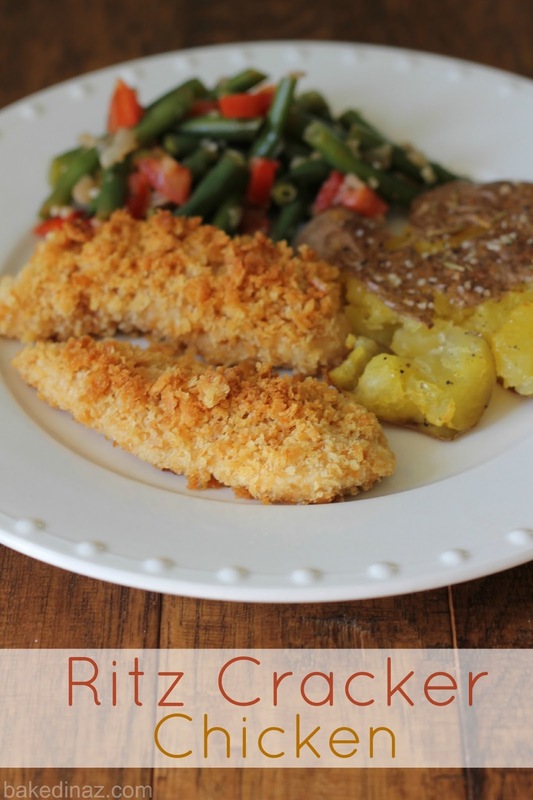 This recipe may not be new to some of you, but if you have never had this before make this chicken! Sorry to be so bossy but it is so dang easy and so dang good! I had never had this chicken until I married my husband. It is another one of his “Nana’s Special”. A family favorite and I am so glad I “married into this recipe” 🙂 When we get together for Sunday dinner at Nana’s this is always a favorite and nobody can make it quite like she does. The butter & ritz cracker combo is just perfect. This is something you can put together rather quick and will be sure to please. You are gonna want to keep a box of crackers in your pantry, (if you don’t already) this is a good one. Pre-heat oven to 350. Line a baking sheet with foil or parchment paper. Crush the ritz crackers in a food processor or in a ziplock bag using a rolling pin. Put in a shallow dish. Melt butter in a shallow dish in microwave. Dip chicken in melted butter then dip in crushed crackers until well coated. Bake at 350 for 30-40 min or until chicken juices run clear. The amount of crackers and butter you will use depends on how many chicken breasts or tenders you are making. I use 1 sleeve of crackers and ½ stick of butter for 6-8 tenders depending on size. So just start with that and if you need to add more you can. 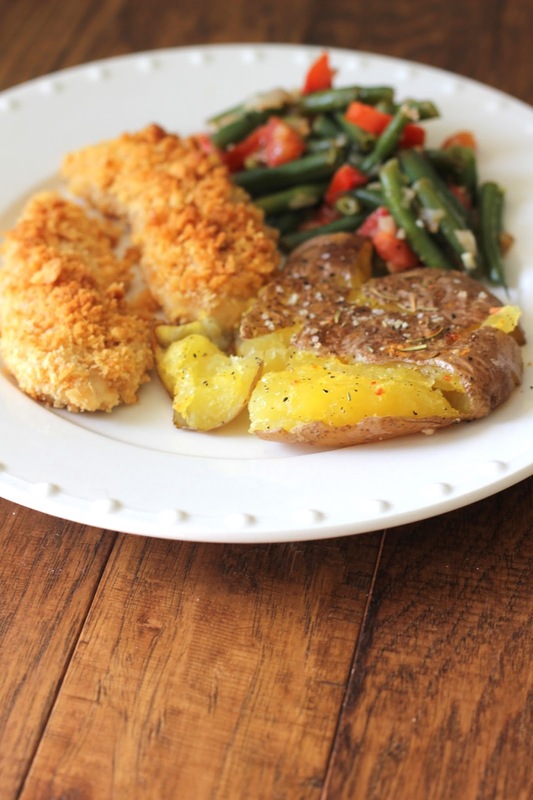 I served this chicken with Lemon & Tomato Green Beans & Pioneer Woman’s Crash Hot Potatoes. Which, by the way, are a new favorite in our house. My husband loves potatoes so I was happy to find a new (to me) way to add them to our dinners. This looks really good, and I love how easy it is! My boyfriend is on a low sodium diet so I think I will try making this with the Hint of Salt Ritz and unsalted butter! Stopping by from the Saturday Night Fever link party! I wanted to let you know that I made this for dinner tonight and it was delicious! Definitely a keeper! This meal has everything, I can put it together quirky and I'm sure my family will love it! Thanks for sharing at Saturday Night Fever! Do you season the chicken too? Could I replace the butter with eggs and milk? you could but it would not have near the same flavor. the butter is a big part of why this is so good.